CPO specializes in reviving obscure works, with a particular focus on German-speaking composers of the Romantic era. 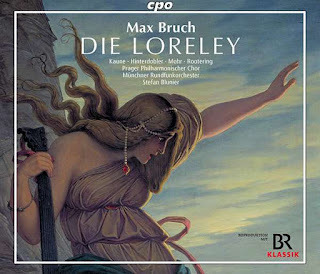 This latest offering is no exception, a “Grosse romantische Oper” based on the Loreley legend, and composed by Max Bruch while still in his early 20s (completed 1863). It’s a live recording, taken from a single concert performance. That makes stagability a marginal concern, but as a purely aural experience, the work is compelling: juvenile, yes, and often simplistic to a fault, but fully justifying its grand scale, and beautifully orchestrated throughout. The genesis of Bruch’s Die Loreley is bound up with the posthumous reputation of Mendelssohn. The libretto, by Emanuel Geibel, was originally written for Mendelssohn, and the older composer did in fact set several numbers, the fragments collected together as his op. 98. Several decades later, Bruch took an interest in the project, by then an aspiring prodigy himself, keen to fit the Mendelssohn mold. Bruch’s anti-Wagnerian tendencies also attracted him to Mendelssohn and his legacy. But Giebel was opposed, and only finally granted Bruch permission to use the libretto when the younger composer presented him with the completed score. In Geibel’s version of the legend (the liner points out that Loreley is not actually a legend at all, but an idea of Clemens Brentano early in the 19th century), the spirit on the rock is a spurned lover, Lenore. The first act tells of how Otto rejects her in order to marry Bertha. In the short second act, Lenore enlists the help of the spirits and plots her revenge. Act III begins after the wedding of Bertha and Otto: When Otto’s double life is revealed, Lenore becomes the center of attention. She is tried for witchcraft and narrowly avoids being burnt at the stake. By the last act, Bertha has died, and the community is more subdued. But Lenore is still intent on revenge. Her singing attracts Otto to the rock above the Rhine. But when she spurns him, he jumps to his death, the Rhine spirits taking revenge and hailing Lenore, now transformed into the Loreley, as their Queen. Musically, the story offers Bruch a great deal of variety and potential drama. Fittingly, for the wine-growing region of the Middle Rhine, the chorus and several of the minor characters are vintners, and much of the first act concerns the making of wine for the wedding of Bertha and Otto, all to hearty choruses. The church plays a major role the slightly two-dimensional morality, giving occasion for a tender Ave Maria in the first act, Lenore accompanied by the chorus, and some atmospheric organ interjections in the fourth. The second act, where Lenore communes with the spirits, clearly owes something to the Wolf’s Glen in Der Freischütz, but it doesn’t come close for atmosphere or menace. The recording is a co-production with Bayrischer Rundfunk, who presumably broadcast the concert around the time it was given, in 2014. Stefan Blunier leads a lively account, sensitive to Bruch’s always-apparent aspirations to high drama, but never laboring the music when it lacks the substance to make its full impression. The singing is mostly fine, with the all-German cast delivering excellent diction. In the title role, Michaela Kaune has a throaty but elegant soprano, with a pronounced by well-controlled vibrato. Thomas Mohr sings the role of Otto with great assurance—there are plenty of vocal acrobatics in this lead tenor role, but Mohr has a solid tone and good support, plus the agility to tackle Bruch’s often intricate melodic lines. As Bertha, Magdalena Hinterdobler is well distinguished in tone from Kaune, Hinterdobler a slightly lower-set soprano, her breathy tone less musically pure, but always highly expressive. The comprimario roles are never less than serviceable, although the vibrato of Sebastian Campione, as Hubert, father to Lenore, is uncontrolled and distracting; while Jan-Hendrik Rootering brings an aging voice to the prominent role of Reinald. The Munich Radio Orchestra are serviceable too, although the difference in standard between this ensemble and the BRSO is all too clear, not least from the unfocussed string ensemble of the former. The recorded sound is good, although the climaxes lack detail. The chorus, the excellent Prague Philharmonic Choir, are sometimes required to sing offstage, a sound effectively rendered, though it is not clear how this was achieved in a concert setting. Packaging and documentation are up to CPO’s usual high standards, with detailed synopsis, full libretto, some artist bios, and an interesting liner essay, all presented in German and with excellent English translations. This review appears in Fanfare magazine issue 42:5.